This is a true flowering plant (not a moss) that grows on trees. It resembles the lichen "Old Man's Beard" or "Treemoss" (scientific name: Usnea), which is found all over the world including the UK. 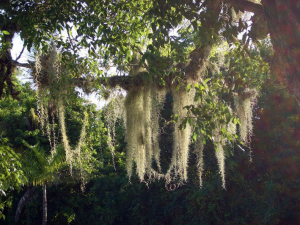 Spanish moss is described as a gray beard hanging from the branches of the tree. When it is big it looks more like long frizzy (grayish) hair. The tree in the photos is a West Indian Mahogany (Swietenia mahagoni, Fam. Meliaceae).